I've now had the pleasure of seeing Alfonso Cuaron's moving, deeply personal drama Roma twice now. Over the weekend Netflix flew some of us out for a special screening of the film with Cuaron in attendance, and I can say that upon second viewing it grew in esteem for me. No longer do I think it just a contender for the Best Foreign Language Oscar, but for Best Picture. That would make it Netflix's most successful project yet and validation of their recent efforts to be major players during the awards season. I think Roma has the goods, but I'll be very interested to see how people react to a story that is so specific to Cuaron. Set in the 1970s, the Spanish-language drama tells a story rooted in Cuaron's childhood and the women who were a major influence on his life. It follows Cleo, played by first-time actress Yalitza Aparicio, a domestic worker from an indigenous tribe who works for a middle-class family at a time of great social upheaval. The trailer doesn't feature much dialogue and is mostly a mood-setter, but it also should give you an idea of how beautiful this movie is. Cuaron acted as DP and he lovingly holds on to every image as if reluctant to let these cherished memories go. 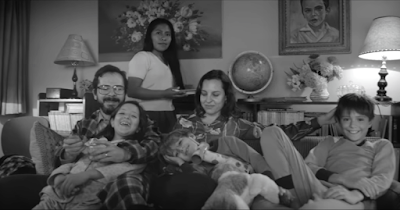 Roma hits theaters on November 21st before Netflix makes it available for streaming December 14th.